We took Aspen’s FFA lamb to be slaughtered (or “processed” if you are going for PC) a few weeks ago. We went to Dutchman’s Meat Market in Fredericksburg and they did an excellent job and were more than reasonable on price. 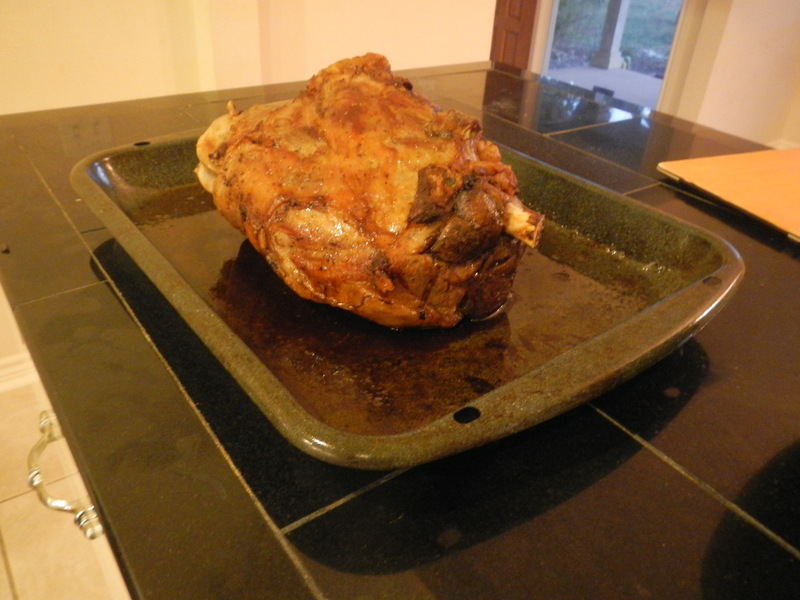 Since then I have made lamb chops and lamb burgers and then last weekend I decided to make Leg of Lamb. This was pretty scary. We only got one leg, the other was pieced out, and I didn’t want to mess it up. Plus, when you know where your meat came from and the work that your daughter put in, you want to give it the respect that it deserves. 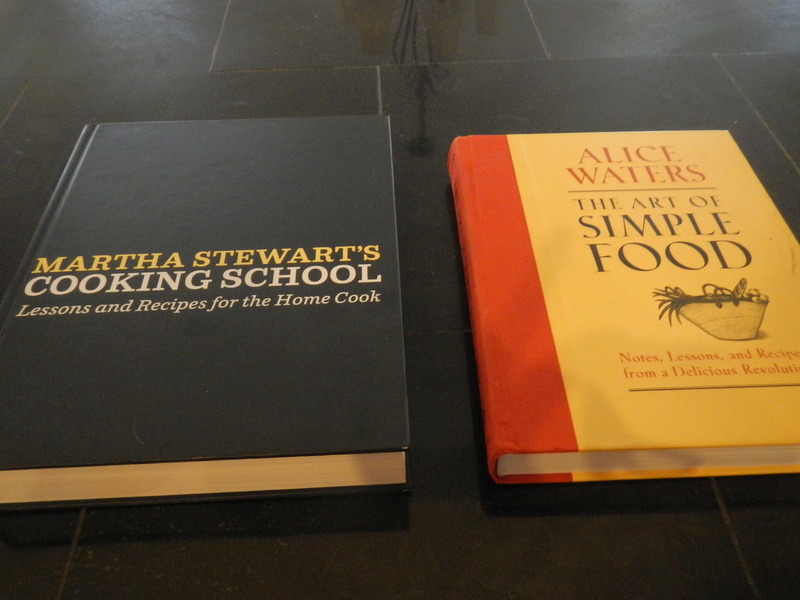 I looked at two different cookbooks, Martha Stewart’s Cooking School and Alice Waters’ The Art of Simple Food. (Both great cookbooks) The first called for inserting garlic and herbs while the second was simple salt and pepper. With the quality of the meat, I knew that Alice Waters method was the way to go. Not that extra aromatics wouldn’t be delicious, but I wanted the flavor of the meat to be the star. 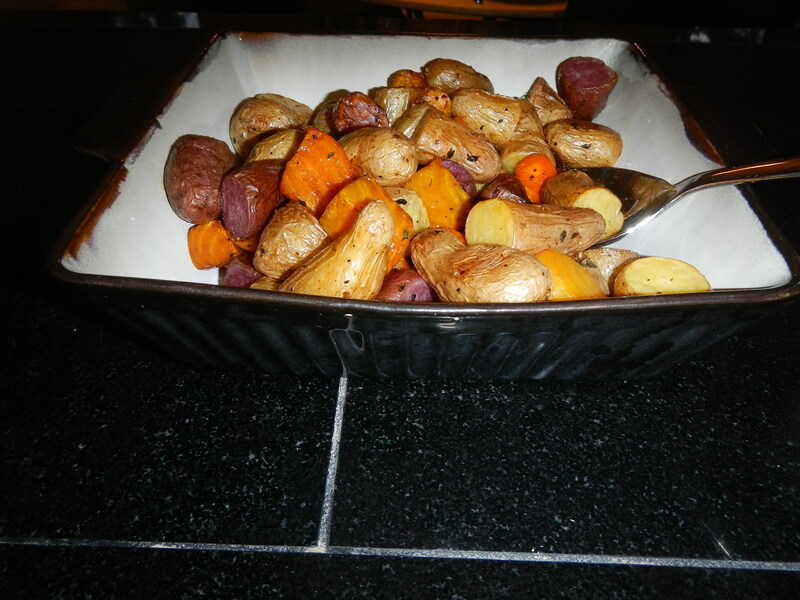 I finished off the meal with roasted veggies, carrots and golden beets from the garden, and fingerling potatoes from the store. 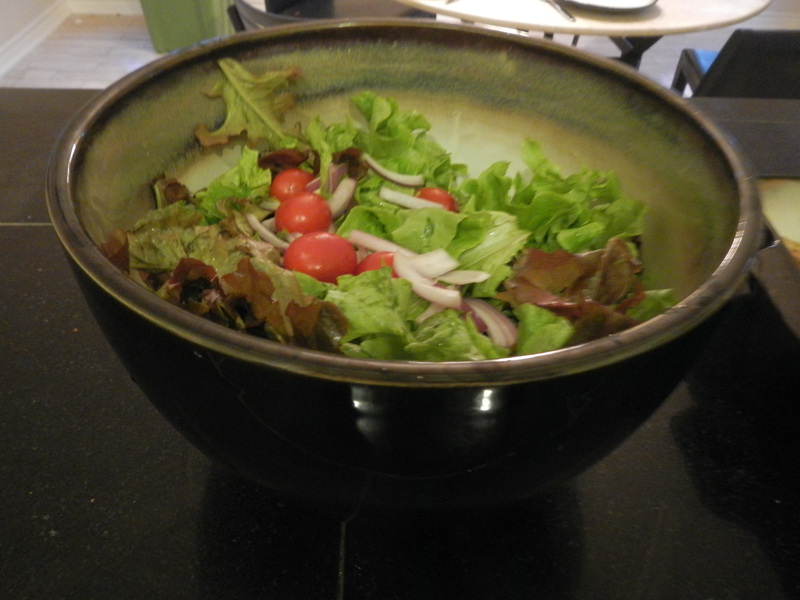 I also made a greek salad with home-grown lettuce and two different sauces, one a greek yogurt with fresh parsley (from the garden of course) and garlic, the other olive oil with lemon, thyme, parsley, garlic, s&p. For dessert I tried Baklava. I used Alton Brown’s recipe, which should have worked, but he didn’t dummy it down enough for a non-baker like me. 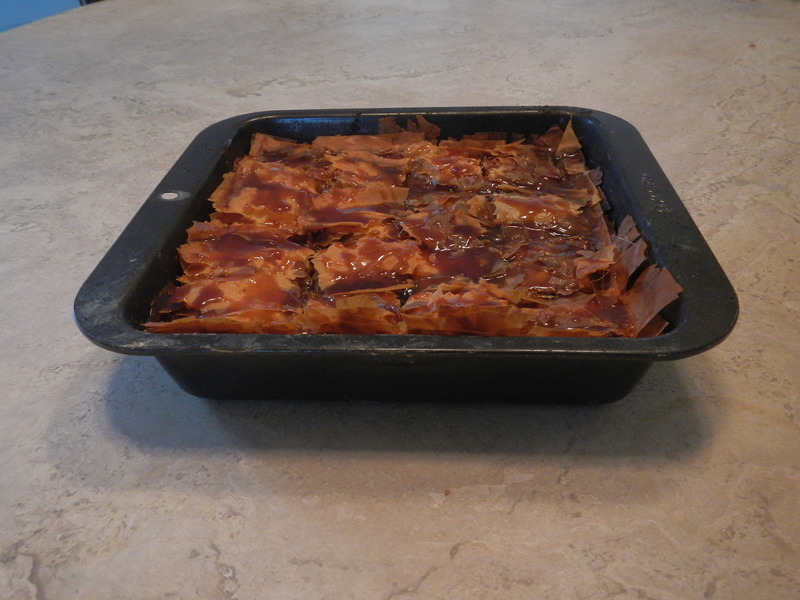 I managed to defrost the phyllo dough, create the filling and correctly cook and layer everything. Where the issue came in was making the honey sauce. It called for bringing the honey, sugar, and water to a boil and boiling for 10 minutes. What I did not know is that all boiling is not the same when it comes to sugar. I guess I made candy. The baklava wasn’t inedible, but it made a better topping for ice cream than a standalone dessert. Congratulations on your daughter’s lamb. The photo of the leg made my mouth water. It’s been a long while since I’ve enjoyed lamb. Also, I just read about little Bean and am so sorry for your loss. It’s really hard when our pets are ready to go and we’re not quite ready to let them go. A dog does enjoy a warm day in the garden. I’m sure little Bean had a very good life with you. Thanks. Eating your own poultry and rabbits is one thing, the lamb and pig are a big step for us. We figured someone is going to eat him, so why not someone who fully appreciates all the hard work. Thanks for you condolences. I’m definitely missing him this spring while I’m outdoors working. Btw, I love your avatar. Owl’s are my favorite! Your self-sustainability is so impressive and you’re a good cook to boot! Your meal looks fabulous! Thanks, I try. It helps when the ingredients are so good!